I lead strategic projects at the We Mean Business coalition, and am truly excited about the deep collaboration and systemic impact we are having through the coalition's unique approach to bold climate action. What is We Mean Business? 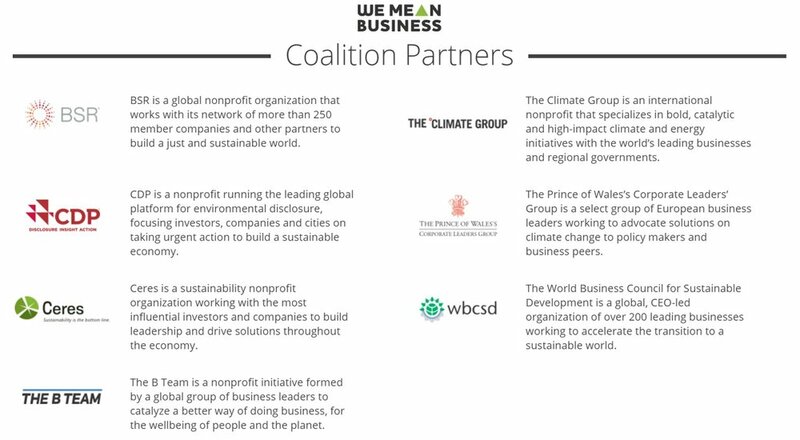 We Mean Business is a global coalition of nonprofit organizations working with the world’s most influential businesses to take action on climate change. Our collective mission is to ensure that the world economy is on track to avoid dangerous climate change by 2020 while delivering sustainable growth and prosperity for all. The coalition brings together seven organizations, BSR, CDP, Ceres, The B Team, The Climate Group, The Prince of Wales’s Corporate Leaders Group and the World Business Council for Sustainable Development. Together we catalyze business action to drive policy ambition and accelerate the transition to a low-carbon economy. How do companies take action? Our We Mean Business coalition partners facilitate businesses' uptake of bold climate commitments, which are helping companies seize one of this century’s most significant business opportunities. Hundreds of companies now recognize the transition to a low-carbon economy is the only way to secure sustainable economic growth and prosperity for all. The key to this is our systemic approach - we are working with organizations and stakeholder groups "across the system", putting energy behind what is working, listening and learning from what is not, and coalescing around a series of 12 climate commitments (+more coming soon). In other words, in what can be a crowded field, we are not creating new climate initiatives to compete or confuse, but rather working directly with leaders in the system to create the shift we are all after, together. Science-based targets Initiative (SBTi): A collaboration between CDP, World Resources Institute (WRI), the World Wide Fund for Nature (WWF), and the United Nations Global Compact (UNGC). The Net-Zero 2050 Team is a leadership group of CEOs and their companies, who are working together to accelerate the just transition to net-zero greenhouse gas emissions by 2050. They each have committed to set a science-based target, and further pledge to phase out all greenhouse gas emissions by January 1, 2050. They also pledge to use their influence to advocate for policies that support an economy-wide transition to net-zero greenhouse gas emissions by 2050. E100, EV100 and EP100: All three of these commitments are led by The Climate Group in partnership with CDP. Committed companies are pledging to 100% renewable electricity, working to massively increase demand for - and delivery of - renewable energy; accelerating the transition to electric vehicles (EVs); and doubling the economic output from every unit of energy consumed. Low Carbon Technology Partnerships initiative (LCTPi): Led by World Business Council for Sustainable Development (WBCSD), the initiative is comprised of over 160 companies and 70 partners that are committed to accelerating the transition to a low-carbon economy. For example ensuring food security, resource efficiency and climate resilience through Climate Smart Agriculture, and making freight transport climate compatible.